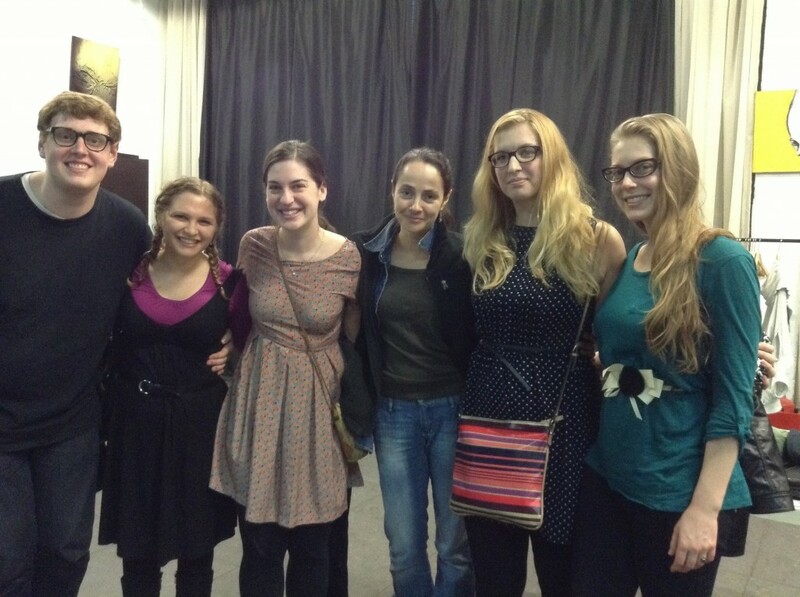 American Course at GITIS Spring 2013 Alumna Eliana Sigel-Epstein gives us an inside look at her time abroad after classes ended this spring. Read more about Eliana’s summer on her personal blog here. Classes at GITIS ended on June 4. The last week was spent learning from the Dean of the Directing Faculty who specializes in Michael Chekhov’s theories and taught alongside the assistant teacher to Michael Chekhov, himself. Ever since high school, I have been particularly interested in M. Chekhov, so it was sort of a long-time dream come true to work with a teacher who is so close to directly studying with M. Chekhov. I think one of my favorite exercises we worked on the last week explored four different ways of conceptualizing characters: as Earth, Water, Air, or Fire. It involved exploring the physicality and the emotional effect of that physicality when, essentially, “stuck” in that element. So, for Earth, we imagined that we were each stuck in a pile of rocks and were trying to break free. For Water, we imagined that we were at the bottom of the ocean trying to run as fast as we could. I then loved imagining which element was strongest in myself, my classmates, characters in plays I had read, etc. This fall, I will be enrolling directly in GITIS in a post-graduate program called “Stajerovka.” I will be studying with Russian GITIS students in the Acting/Directing program, learning from many of the same teachers I had this semester. This is all, of course, without a translator of any sort, meaning my knowledge of the Russian language needs to be awesome if I want to understand anything that the teachers are saying. Because of this, and a general desire to improve my language skills, I enrolled in a Russian language school, called the Pushkin Institute, for the summer. I had Russian language class for four days a week for about 4 ½ hours each day. 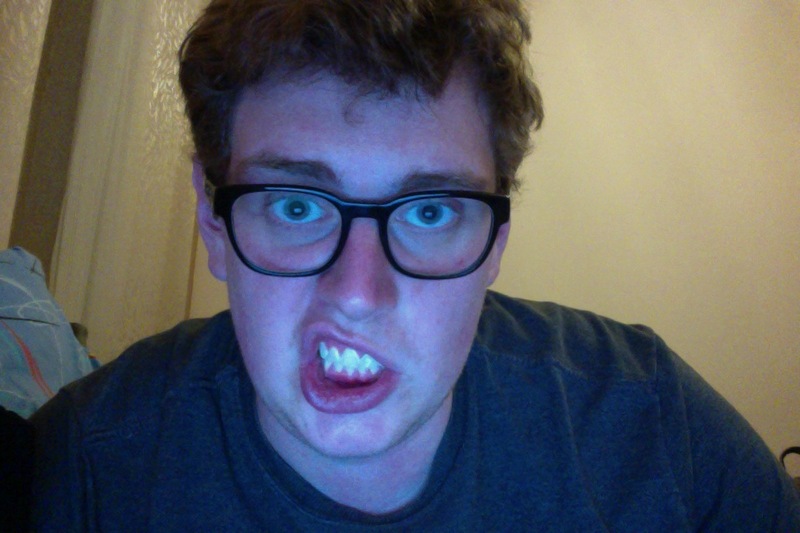 It was definitely exhausting to spend the majority of my days studying such a complicated language. But it provided the kick-start I needed to prepare for the fall. Also, I can now order in restaurants much better and even answer people when they ask me questions on the street! However, before my time at the Pushkin Institute started, I also took a two week long trip with my parents. We had a whirlwind of a time, starting in St. Petersburg, then moving on to Moscow, and finishing in Kyiv, spending about 5 days in each city. The adventure started from the moment my parents landed at the St. Petersburg airport and we finagled a reasonable price for their taxi to the hotel. As soon as they dropped their suitcases off, we hit Nevsky Prospect, stopping almost every twenty steps for my mom to read to us from her guide book and for my dad to take pictures. Though jet lagged, my parents powered through a full day – we didn’t return to the hotel until midnight. Which continued to be the trend for all of our St. Petersburg days. Thanks to the Summer Solsitce, St. Petersburg was experiencing what they call “White Nights,” meaning that it did not get dark until about 11:30. And even after then you could still see a bit of twilight in the sky. We took a free walking tour with a great St. Petersburgian named Igor, did the cornerstone tourist activity of taking a boat ride on the Nevsky River at night to watch the bridges open, and of course visited the Hermitage Museum. We also went to Catherine’s Palace just outside the city. All of St. Petersburg was crawling with tourists, both international and Russian. 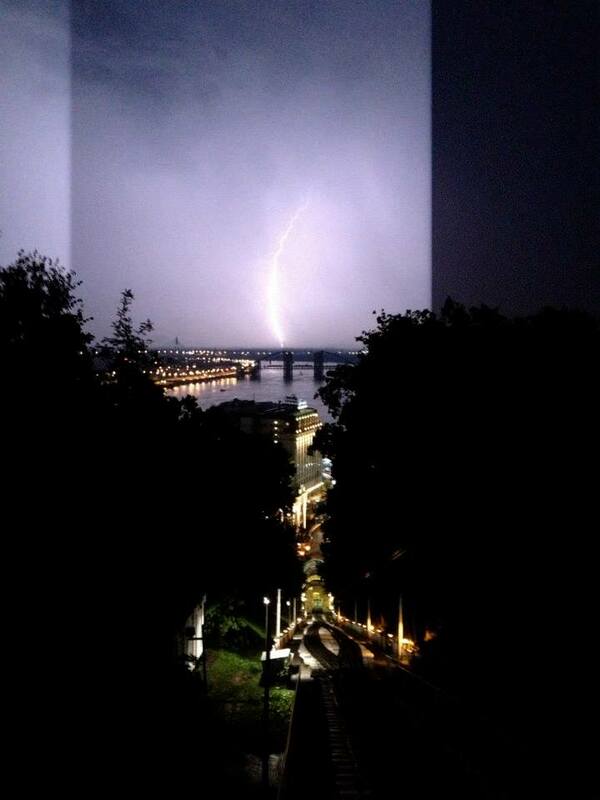 White Nights is a very popular time for tourists. However, Catherine’s Palace was probably the most crowded, tourist-ridden place of them all. The palace and the grounds around the palace were gorgeous and well worth the trip, but the crowds getting inside the palace were worse than the Moscow Metro at rush hour. Another highlight was seeing Cinderella at the new Mari’insky Theatre. I was really excited to see the new theatre with all the press that it’s been getting. The dancers were truly terrific, and the orchestra, conducted by Russia’s most famed conductor Valery Gergiev, sounded beautiful. The acoustics really were fantastic. But for me personally, the highlight was going to the Museum of Political History, which featured two awesome exhibits. The first was an overview of the last two centuries in Russia. The second exhibit focused mostly on how the leaders of the Soviet Union from Lenin to Yeltsin used and maintained their power. There was a large focus on Stalin and the tactics he used to maintain power, through propaganda and total control of Soviet life. It really clarified a lot of things about 20th century Russian history for me. It was also really incredible to see artifacts like documents signed prohibiting certain artists’ works or pictures of landowners rioting. 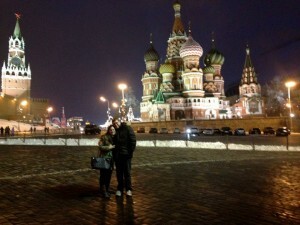 After five days of exploring St. Pete, we took an overnight train to Moscow. We had scheduled a driving tour of the city for our first day, and somehow managed to survive and enjoy it through our total exhaustion. 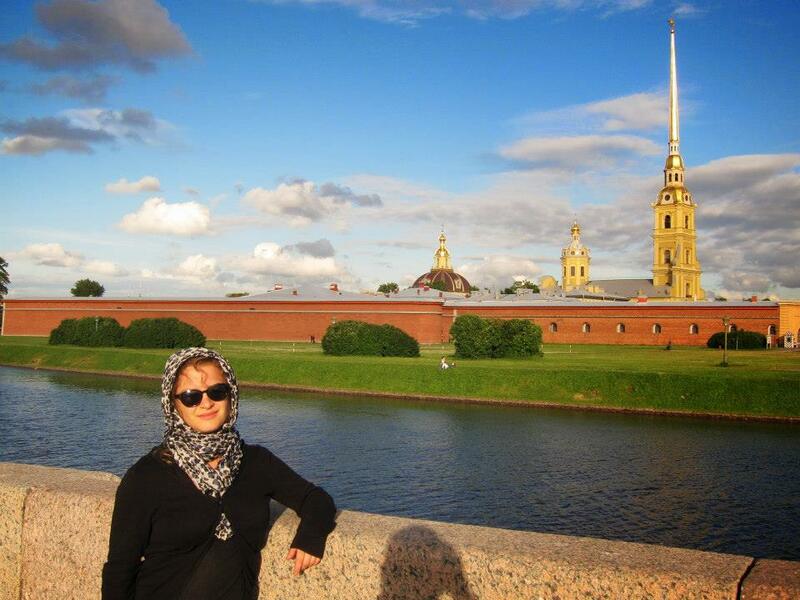 The next day we got a tour of the Kremlin and enjoyed some more historical education. We of course also saw Lenin, St. Basil’s, some art museums, Gorky Park, Kolomenskoye Park, the All Russian Exhibition Center, the Space Museum. And I insisted on taking them to my favorite Moscow Metro stations, which they really enjoyed seeing. I even learned some trivia about the metro stations from my mom’s guidebook. Unfortunately, however, there was no way for my parents to see my favorite part of living in Moscow – incredible Russian theatre. Most theaters’ seasons were closed for the summer, and if I were going to take them to a show, I would want it to be something that they could enjoy despite the language barrier. One of Krymov’s shows would have been perfect to take them to, because of the limited amount of dialogue he uses, but none were playing. We did, however, wind up going to the Bolshoi Theatre – now that the Mari’insky had whetted our appetites for ballet. The Bolshoi Ballet experience was as different as night and day. Unlike the Mari’insky, everything from the building, a recently finished reconstruction, to the ballet itself was traditional and grand and beautiful for the sake of beauty. We really enjoyed both ballets each for different reasons, and I’m really glad that we got to compare the two. Another overnight train later, and we began the third leg of our trip in Kyiv (one of the many things I learned about Kyiv/Ukraine/Ukrainian is that “Kiev” is the transliteration of the Russian word for the city and “Kyiv” is the transliteration of the Ukrainian word for the city). It was the perfect place to end our adventures because Kyiv is a much more laid back city than the previous two we visited, and by that point we were exhausted. I knew very little about Kyiv and the Ukraine, so I really loved learning about its history. We took another free walking tour lead by a young Kyivan who talked freely about his opinions of Kyiv and his home country. It was very interesting to get a glimpse into the life of someone my age in Kyiv. 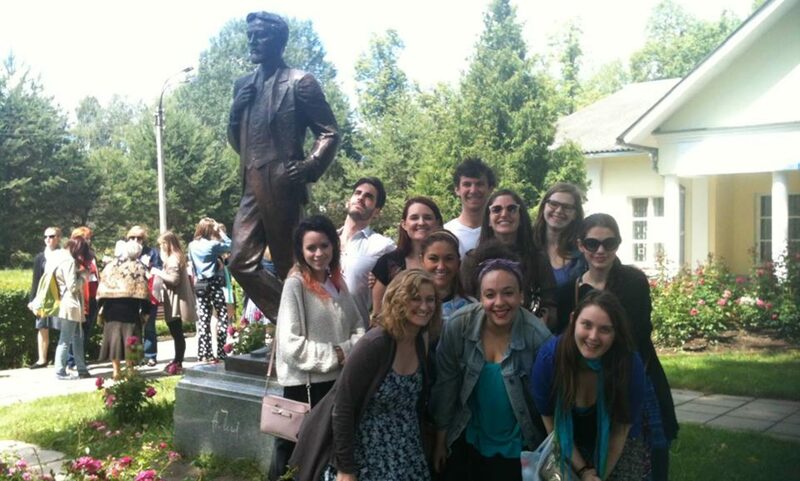 We also went to the Chernobyl museum, which turned out to be one of our favorite museums of the entire trip. The English audio tour was very informative, and the memorial to honor the victims within the museum was beautiful and interesting. Kyiv has a long history of Jewish influence; for instance, Sholem Aleichem (author of “Tevye and His Daughters,” on which Fiddler on the Roof was based) lived in Kyiv, and the town that inspired Anatevka is located nearby. As for the more unfortunate moments of Jewish history, Babi Yar is located in current Kyiv (it was just outside of city limits in 1930). There were several memorials scattered around the field, including one for the Ukrainian Nationalists who were killed at Babi Yar, gypsies who were killed at Babi Yar, a memorial for a woman who had served in the resistance, and the memorial erected in the 1970s that had absolutely no mention of the disproportionate number of Jews killed. The memorial for the children who died was particularly moving. It was of three dolls that look like children from afar but as you get closer you see subtle details symbolically linking them to the tragedy at Babi Yar. Small holes in the statue symbolize bullet holes, their heads have been partially torn off, and the boy wears a Yamaka on his head. It was very beautifully done. My parents left early in the morning the next day but my train to Moscow was later in the day, so I had one extra day there. I walked through a beautiful park to the main square of Kyiv called Independence Square, the sight of both their October Revolution in 1917 and the Orange Revolution in 1991. The day before was actually their Constitution Day and around the Square were remnants of a parade that I guess took place that morning. I picked up a “Kyiv Cake” to take back to Jackie and Daniel – vanilla cake with nuts and wafers and chocolate frosting. It’s really sweet but also quite light. I had been told that it is a Russian tradition to bring a Kyiv Cake back to Moscow after a trip to Kyiv. Sure enough, nearly everyone on the train had a Kyiv Cake with them too. Another highlight of the summer was a trip to the dacha of the family we stayed with when we visited Yaroslavl. The word dacha usually gets translated to “summer cottage,” but it is really so much more. It is an experience. It is very common for Russian city dwellers to have one of these “dachas” in a small village that they frequent as soon as the snow melts enough to drive on the narrow gravel streets that leads to the dacha. And dacha season lasts until the first snow of the winter. Until coming to Russia, I had never heard of a dacha, but apparently they are a Russian tradition dating back to the 1700s, that became even more popular during Soviet times throughout the entire Soviet Union. According to Wikipedia, up to 50% of Russian families have dachas. Our experience at the dacha was really lovely. We woke up late, played cards, walked to the small pond, ate outside, just really relaxing. I kept thinking how nice it must be that they could frequent this second country home whenever they had a free weekend, especially because their dacha was only about 40 minutes away from their home in Yaroslavl. Their dacha, and from what I can tell most dachas, consisted of one floor split into two rooms, and an attic which they converted into a third room. They had an outhouse (the nicest outhouse I had ever seen), berry bushes, herb bushes, and (the piece de resistance) a banya. Now, I had thought that a banya – usually translated to “bathhouse” – referred primarily to the large bathhouses that you can visit in Moscow and other Russian cities. However, their banya was a separate wooden house in which you use chopped wood to crank up the heat in one of the banya’s small rooms to 90+ degrees Celsius. You hang out in the hot room for about fifteen minutes, then you can retire to the other small room to snack and chat and cool off, or go outside to cool off a bit more. Then back into the hot room and do it all over again. So, it’s not just about going into the hot room – which was like a sauna except it was entirely dry heat – it’s more about the whole experience of relaxing together. Apparently the extreme dry heat is good for you, especially your skin, but I more enjoyed the whole ritual of the thing, and the opportunity for bonding with your fellow bannya-mates. One night, we made pelmeni, which are small dumplings that seem to be a staple of any Russian’s diet. Again, the experience was not just about the physical making of the pelmeni – which was fairly easy and I feel that I could repeat it – but about the time that you spend together. We also bought milk from a lady’s truck that looked straight out of Fiddler on the Roof – minus the horse. I think it was my first time drinking milk that had come straight from a cow. We returned to Yaroslavl late on Sunday, showered (finally), and went bowling, Which was not something I expected to do while in Russia, but there you have it. But seriously, I could sit and watch the grass grow with these people. They are just so ridiculously warm and generous. The true embodiment of Russian hospitality. This is always the first thing that comes to mind when I think of the American Course at GITIS. We say that a lot on this website along with unique and once-in-a-lifetime. It’s a big thing to say, but it’s the truth. My relationship with IFTER and the American Course at GITIS goes back to the very beginning, before any of it had a name. More than two-years later I can call myself part of the inaugural class of the American Course at GITIS. Our last day of class was three weeks ago and now, even more than I could have imagined, I am changed by the course. This wasn’t my first time spending a semester in Moscow or studying acting there for that matter. 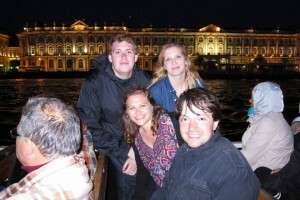 In 2009 I spent a semester in the American Studio at the Moscow Art Theatre School with the National Theatre Institute. I thought I knew what to expect. There were some things that my previous experience did prepare me for, but the discoveries I made at GITIS were still endless. So how did my life change? When I put it in words it sounds a little simple, but sometimes the simplest discoveries are the most precious. Here are some key discoveries that I took home with me. I have always been one to be aware of my surroundings– observant of my environment and the people in it. This is key for an actor and sharpening of this awareness is something that I love about the Stanislavsky System. Though I can usually describe without trouble the wall decor of the restaurant we were in last night and at least five conversations at the tables around us I was missing something: self-awareness. This is a skill that I really built over the eleven weeks of the American Course. I learned to be aware of my body, inside and out, aware of what it could do with proper preparation. I began to learn how to tell when my body was ready for a task and if it wasn’t ready how to prepare it. I became aware of each piece of my instrument, how they work together and how many stories I can tell with each piece of me. I then became aware that putting them all together brings countless possibilities. I became more aware of my emotions, my impulses and where they come from. I became aware of my cliches and the little ticks that I have that make me me. It all seems so simple, because we live in our bodies every day, but it’s a never ending world to discover. Working in an ensemble is a strength of mine. I am an actor’s actor. I like to give on stage, to focus on my partner. I’m not too fond of monologues. Ensemble training is something else I love about Russian Theatre training. Guess what? Monologues aren’t going anywhere. Guess what else? You don’t have to be responsible for them any more! Ready for a secret: at GITIS we worked on the concept that your partner is always responsible for your next line. If your next line is a monologue then, well, they must be pretty powerful to spark that monologue inside of you. Think about it: when you say something to someone you have a reason for saying what you are saying in that time and place to that person. They may not say a word in a scene (in life or on stage) to spark 200 words from you, but somehow they do. I’m a curious person. I ask ‘why’ a lot. I’ve always been analytical and have taken my faire share of analysis classes, but never before like this. No matter how many questions I ask they are never enough to analyse text to the fullest. Even before the first line of the first scene in a play there are a lot of questions to answer. Sometimes you can’t find the answer for a question you have at the top of the script until Act IV, but you have to find it and you will. Something as simple as the time of day or the direction the wind is blowing can completely change a scene. You’d be surprised what is hiding deep inside that script. The more you discover, the more questions you have. Now when I read a scene or even look at a painting I am hit with a million questions and find myself on a search for just under a million answers. This experience wasn’t only life changing in the classroom, but culturally too. An average of three times a week we would go to the theatre. We would see professional shows, student shows: comedies, dramas, operas, movement theatre, classical, avant-garde. We were filled with ideas and inspiration. We could apply what we learned in the classroom to many real-life situations. And while sometimes I wished my Russian was stronger while I was at the theatre there is something magical about watching Romeo and Juliet in their balcony scene and forgetting Shakespeare’s words for a moment just to feel the heat and the emotion that runs through that moment. Everyday in Moscow is an adventure. From discovering new museums, parks and restaurants to getting off at the wrong metro stop just to see what’s there or going to the grocery store. Being immersed in a new culture is such an exciting way to learn about you, your own culture, what it is to be human and what it is to be part of any culture. It’s also a great way to find an adventure around the corner. Talk about a great way to add tools to your tool box for building a character, all while building great memories! Now that the course is completed and I am back in the United States I feel a little like a different person, okay not different, just a better, more aware, more skilled, more thoughtful me. I am continuing some of the training and exercises that I really connected with at GITIS on my own now that I am home. I have a lot of tools that I can’t wait to try out in building my next role. I’m also working at IFTER making preparations for the next American Course at GITIS and looking forward to sending a second class to this amazing program! Want to know more about the program or what is happening at IFTER? Please feel free to contact me at info@ifter.org. I’d love to hear from you! 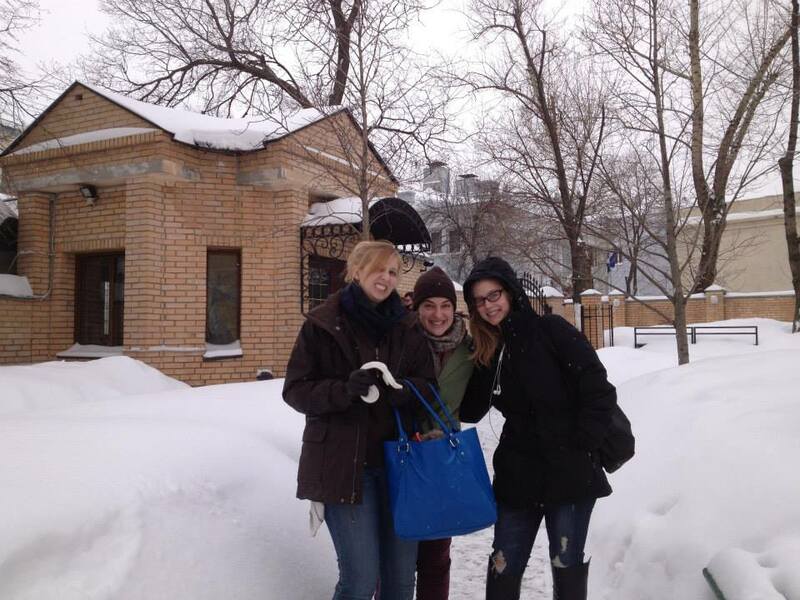 Interested in The American Course at GITIS? Get more info and apply! Eleven weeks of theatre in Moscow isn’t enough to see everything, not even close, but we did try to offer our students a taste of what is happening at GITIS, with GITIS alumni and professors, and in Moscow. Our last week of theatre we stayed close to home and saw some amazing professional work that was all connected to GITIS in one way or another. Another exciting show directed by Oleg Glushkov full of expressive movement and featuring a chicken. Be sure to check out some great production photos here. A very long title for a whirlwind of a show. Dmitry Krymov pushes boundaries in this amazing piece. You may not be able to yell fire in a theatre, but he will be sure to come as close as he can. Follow the link about to read more about the show, see some reviews and some production photos. This show opened in 2005 as a diploma show for the GITIS class of 2006. It has been running ever since and with good reason. A story of love, loss and home, Marienbad pulls on your heartstrings without forgetting to tickle your funny bone too. Our Improv professor, Anastasia Imamova, is in the cast and invited us as her guests. It was such a treat to see the work that she herself did as a student and has continued for years since. Follow the link about to read more about the show, see some reviews and some production photos. Here we are at the end of the semester. We finished our Acting and Directing course with seven classes with Vladimir Baicher. Baicher is the Dean of the Directing Department at GITIS and an expert in Michael Chekhov’s techniques. Though our time with Baicher was short, we were able to dig into detailed principles quite a bit working with psychological gesture, energy, given circumstance and events. Baicher carefully balances lecture and physical practice to demonstrate each principle. Through exercises, improvs, etudes and scene work our students began to really dig deep into the layers of a character, their relationship with their environment and each other and the scene. This week we finished all of our classes, took a look at how far we’ve come and said “until the Fall” to GITIS, our professors, our time here and each other. Thank you so much for sharing this journey with us! We left off last week with our observations of people and creating their stories. Moscow is home to just under 12 million people. That leaves quite a few interesting people to observe in many interesting situations. When you add a touch of imagination the possibilities are endless. Each student was required to observe and tell the stories of three people. The story should explain how they got to this moment or why they seemed the way they seemed from the outside. From the three stories the story that was the most interesting or that the student was most connected to was chosen to be used to develop the character on stage. Each student was assigned to find and bring a “detail” of this character to class for them to use as a prop or a costume piece in discovering this character. From here each student one by one found the way their character walked, talked, breathed and even what animal and object this character would be. Each character was interviewed by the class and required to answer in great detail. Each character also delivered a monologue about their thoughts, feelings, dreams and observation. This project brought together character development and imagination with quick thinking and extreme attention to detail. Stretching beyond comfort levels to find each detail of the character was absolutely necessary. The results were incredible! Here we are at the end of Week 10 in our 11 week course. Wow! I’m sure you can imagine that everyone is running around trying to see the shows that they’ve wanted to see for weeks before it’s time to end the semester. On top of that, people are inviting us to more shows than ever. We had six shows scheduled over the last five days and on top of that more shows students chose to see on their own. Obviously it was impossible for everyone to see everything. Often our group was parting ways to collectively see as much theatre as possible. For the sake of simplicity, this week we’ll just highlight two particularly special shows for the group. Evgeny Onegin is Pushkin’s most famous work. It has been brought to life on stage many times and in very many ways. This production at Vakhtangov Theatre, directed by Rimas Tuminas, is in its premiere. Tuminas is a very well known director and his work is very popular. Earlier in the semester our students saw his “Uncle Vanya.” After seeing “Uncle Vanya,” “Evgeny Onegin” jumped to the top of our student’s must see lists. Why? Tuminas has a way of taking a story his audience knows so well, stripping it to it’s bare bones and pulling out something fresh while managing to keep and highlight the author’s intention. Plum Palm is a tiny theatre space. A room, that seems to serve as an art gallery by day, with a few lighting instruments and a few chairs for the audience. It’s a great reminder that theatre can happen anywhere. Most of our theatre experiences in Moscow are at the large state theatres. Thanks to the invitation by our Biomechanics professor and director of “Mayakovsky: Top Secret”, Maria Shmevich, we had the great chance to sit in an audience of less than twenty for an intimate and fresh theatre experience. The show was based on the poetry of Vladimir Mayakovsky and was rich with movement. Seeing this show was a great way for our students to see the work that they are doing with Maria in class on the stage and to understand how it can be used and how it can develop. 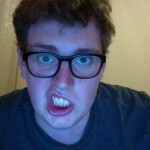 This week’s Student Life post comes from Daniel Barnes. Thanks Daniel for sharing your experience with us! 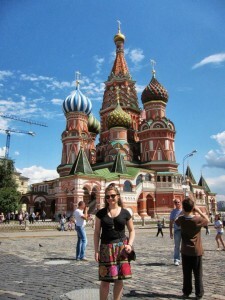 Upon arrival in Moscow, I was swarmed with questions, but the most popular one was definitely “OMG, what is Moscow like? !” Okay, so I wasn’t exactly swarmed with questions, but this still counts. 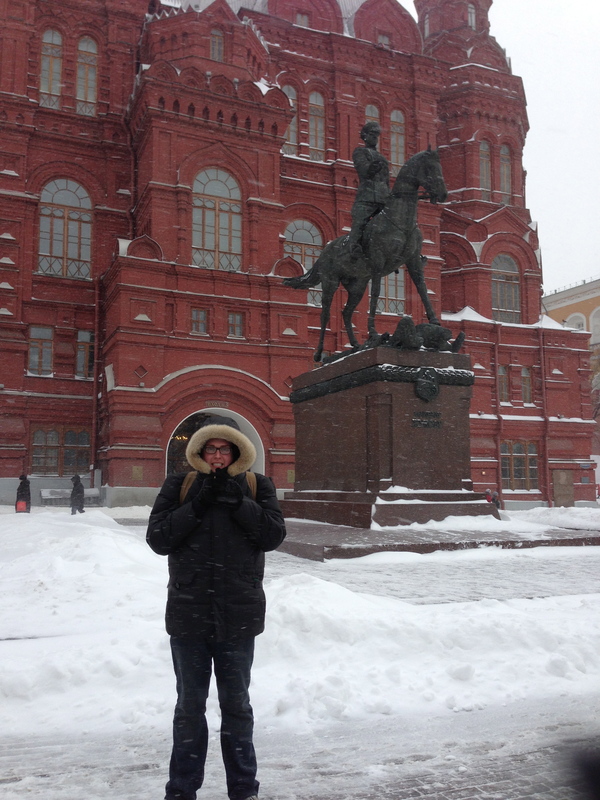 I must say that Moscow isn’t exactly what I expected. You might ask, “Daniel, what did you expect?” To be honest, I think I thought it would be lots of smoke, lots of vodka, and lots of people telling me I need to learn Russian (in Russian). So what is Moscow? Lots of smoke, lots of vodka, and lots of people telling me I need to learn Russian…BUT it is so much more. I know, I know I have only been living here for a short time, but I have done my best to expose myself to the city and culture, and I think that it is beautiful. I (hope) can safely speak for our group and say that we thoroughly enjoyed our experience here, and a large part of that is due to how great the culture is here. Daniel entering Red Square for the first time. For starters, the city is beautiful. What I find fascinating about European cities in general is the juxtaposition of centuries-old buildings and monuments with contemporary architecture. Russia already has very unique historical architecture, but pair that with beautiful skyscrapers and the most gorgeous metro stations I have ever seen. Seriously! If it wasn’t TOTALLY ILLEGAL (or mostly illegal, as I found out today) I would snap some pictures of how beautiful these metro stations are. The first time I went to Red Square and saw St. Basil’s cathedral, I was so pumped. I should probably remind you that I am THE ONLY ONE of the American group that hasn’t been to Moscow previously, so they were eager to see my reaction. I was trying to be super cool (and you thought it came naturally), but I think my excitement beat that out. It really is thrilling to see historical landmarks in person, even in America, but the beauty of the city is that as you look at the domes on the cathedral and walk the vast cobblestone plaza, you can also turn your head to the left and see a huge shopping mall and probably a McDonald’s (Makdonalds). Trying to immerse oneself in foreign culture is also very difficult. In America it is not uncommon to walk a city street and hear ten different languages. However, anyone that has ever been to a foreign country, even for a split second, knows how difficult it can be to do the simplest of tasks without knowing the language. Granted, our group is learning Russian like crazy, but there are still problems that occur almost daily. It just happens. Though, I think I can successfully buy toilet paper and apple juice comfortably now and tell the grumpy cashier, “No, I don’t actually want a new plastic bag today, thank you.” Sometimes she even says goodbye. Score! I think we’re soul mates, really. Truthfully, though, it gets easier to live here and immerse myself every day, and I’m truly grateful to have this experience. I love it here! Oh, PS, Moscow is eight hours ahead of the US (EST), so as I’m writing this, you’re probably enjoying a late lunch. I hope you’re having some cabbage and buckwheat. Maybe some pickles. This week our students started a two week course in Improv. It’s not necessarily what you would see at your favorite comedy club or on tv. It’s not always funny, but it sure can be sometimes. This isn’t your average improv class. Of course, there are many principles that appear here, but this class is about the process of creating a character, an environment and telling a story in great detail from beginning to end. Anastasia Imamova is taking our students on a two week journey that requires a free and alert mind and body to discover the world and to react to it. The work that is happening with Imamova is very different from any of our students’ previous training in the program. In other courses the focus has been much more analytical and focused on taking things slowly and with great control. Imamova asks that her students work quickly and impulsively. She asked that they do now and think about it later. And this doesn’t mean that the work should be sloppy, on the contrary, each action should be made in great detail. Class this week has included impulsive reactions to words, changing a piece of paper into an object and telling a story and even becoming each other. Yes, that’s right, becoming each other. Our course is quite small with only six students. They spend all day every day together in class, at the theatre and at home. This week they had the chance to become one another on stage. Of course, everyone had a few laughs, but more importantly developed characters with great detail. These are people that observe each other every day in many situations. This is a great tool for becoming aware of the complexities of a character. From here Imamova sent everyone out in the world to observe three people and tell their story (or what could be their story) in great detail. Next week we will begin to develop these characters on stage. Be sure to check back to find out where this exercise takes us! Where the Volga and Kotorosl Rivers meet. A huge part of being an international student are the cultural experiences outside the classroom. 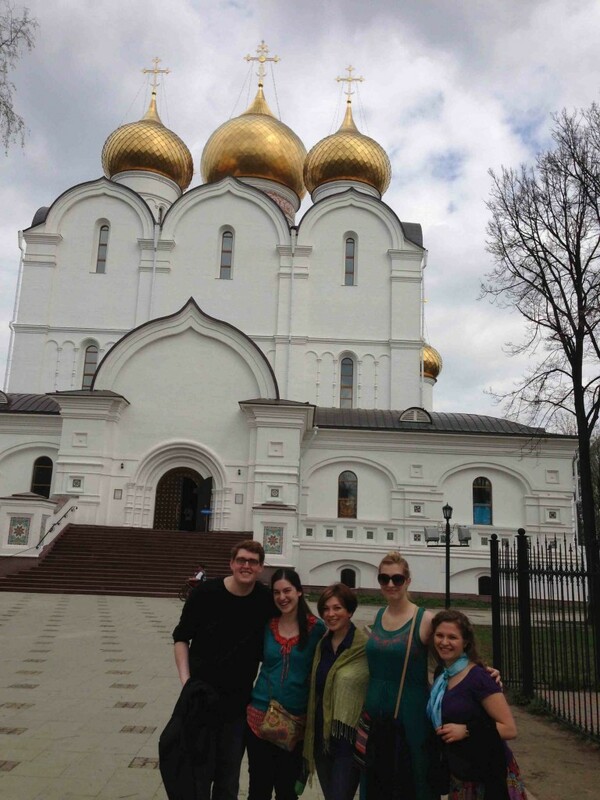 As part of our program this semester we offered students to take an optional weekend excursion to Yaroslavl. Yaroslavl is located about 250 km north-east of Moscow where the Kotorosl and Volga Rivers meet. The city was founded in 1010 and is now one of the largest cities on the Volga with a population of about 600,000. It’s a beautiful relaxing town full of history with plenty to see and do. We arrived by train on Friday night and were greeted by our host family with open arms. Anton, who was our guide for most of the weekend took us on a small tour by car as soon as we arrived before taking everyone to their homes for the weekend. The girls stayed with Anton’s mother-in-law, Lyuba and her son Vlad in their apartment. Our one boy who went on the trip stayed with Anton, his wife Tanya, and their two year old daughter. After a late supper and plenty of conversation (in a creative mix of Russian and English) everyone was off to bed to rest up for sightseeing the next day.Saturday started with a wonderful traditional Russian breakfast before walking tour of Yaroslavl lead by Tanya and Anton. 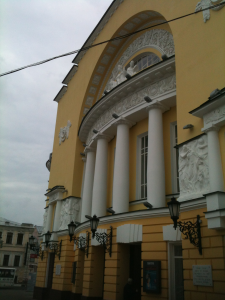 The first stop was the oldest theatre in Russia! The building was closed so we couldn’t see inside. There were no plays playing that evening so we went over to the symphony to see what was happening there. As luck would have it, there was a concert that night and instead of being held in the concert hall it was being held in the Volkov Theatre. We bought tickets knowing only two things: the concert was in the theatre and the symphony was playing Rachmaninov. And on we went with our day visiting parks, churches, and markets. 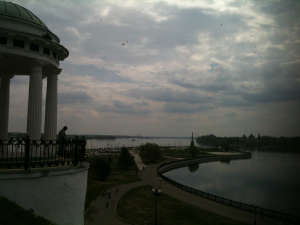 We went to the Yaroslavl History Museum and to the Medical History Museum and took a boat tour down the Volga River. We had dinner at one of Tanya and Anton’s favorite restaurants and all rushed home to change to go to the concert.We walked into the theatre and it was clear that tonight was a special night. People were even more dressed up than usual and there was a special chatter in the air. When we went inside we learned that the concert was indeed very special. It was part of the Moscow Easter Festival and was being performed by the Mariinsky Theatre Symphony Orchestra and Choir conducted by Valery Gergiev. This was much more than we had expected! Everyone was so excited especially because it was impossible for students to get tickets for the concerts in Moscow! After the concert we all had tea and cookies at Lyuba’s apartment and visited with each other. Sunday was filled with more adventure! We started again with a great Russian breakfast before Anton and Vlad took us to the Space Museum. The museum is very new (built for Yaroslavl’s 1,000 anniversary in 2010). Yaroslavl is the home of the first Russian female cosmonaut, Valentina Tereshkova, and a lot of the museum was dedicated to her career. After the museum we continued our walking tour from the day before seeing more of Yaroslavl by foot. Our tour took us to Спасо-Преображенский монастырь (Transfiguration of the Savior Monastery) which was founded in the 12th century (as more of a fort than a place of worship) and are the oldest buildings in Yaroslavl. The top of the belfry there is also the best place to get a view of the city. We continued through more beautiful parks, over historical bridges and down the banks of the river to the eternal flame and then on to dinner. After dinner we all went back to the space museum to see a film at the planetarium. Our last hour in Yaroslavl before we caught the train back was spent with our wonderful host family laughing and talking and drinking champaign to celebrate our weekend together. See more about the trip and what we are doing here from a student’s point of view on Eliana’s blog! Now that everyone has been here for two months there is a greater sense of independence. These last two weeks we only scheduled one show a week instead of our three show average. Why? There are many reasons. The academic schedule was busy, the beginning of May in Moscow is busy, we were also planning a cultural excursion (stay tuned for that blog post), and most importantly, students were choosing shows themselves and going on their own. It’s important to have time to do that. The end of May is going to be very very full of performances to see so there won’t be a chance then for students to go out on there on to the shows that they choose. You may remember from a previous post that we often have invitations to shows. We already have many for the next few weeks, but I am sure a few more will come up. There are so many things to see before the semester ends in two weeks. So, how do our students go to the theatre alone? Every student in Moscow has special documentation (equivalent to the American Student ID) that identifies them as a current student at their school. The card also gives students discounts in the metro, some restaurants, some museums, etc. For a theatre student, this card means that almost any theatre in Moscow will admit you into performances for free. There may not be a seat for you if they are sold out, but you can see the show from the back or from the steps. With most theatres running their shows in repertory that gives students hundreds (if not thousands) of choices of shows to see. This is a dream come true for any theatre student! Mozart’s opera is brought to life in this modern staging. The director took the freedom to change the characters a bit, do some editing and place them in a different setting. Small scenes in Russian were also added in between the German libretto. The movement and usage of space was very fresh and unique to the show. To give you a sense of what we saw the production photos are linked to the Week 8 heading. Enjoy! May 15 was Mikhail Bulgakov’s birthday. Conveniently, it was also the day that we had tickets for the Moscow Art Theatre’s production of The Master and Margarita. What a great way to celebrate the anniversary of the author’s birth. The Moscow Art Theatre (MXT) is undoubtably Russia’s most famous theatre. Their productions are huge. The events of Bulgakov’s book are also huge (*spoilers*): a beheading, lots of black magic, a flying woman, a talking cat, disappearing people and more. How could it all be done on stage? MXT found a way. Like the book the show was daring, bold and rhythmic, bringing a shock to the audience just when they were beginning to feel comfortable. Be sure to click the link to production photos in the Week 9 title! Next week we have assigned shows almost every day of the week! Be sure to check back!